The words consequently and subsequently both convey the sense of afterward or occurring later — but not in exactly the same way. 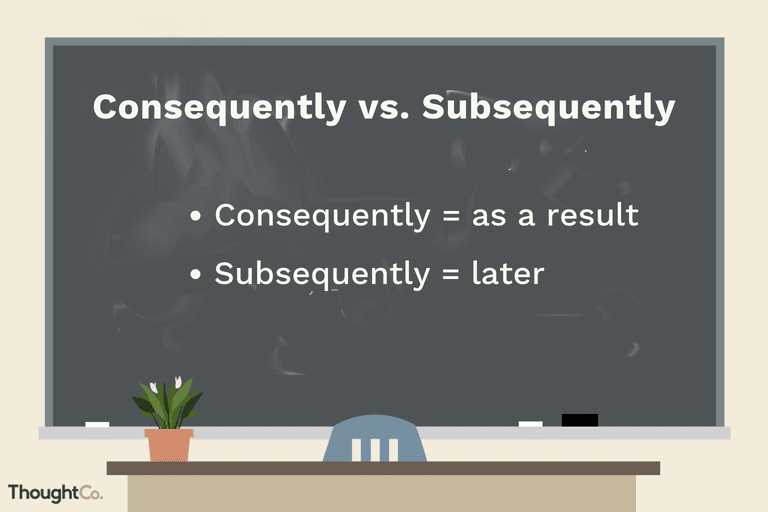 Consequently is a conjunctive adverb that means accordingly, therefore, or as a result: Chris failed the course and consequently was ineligible to graduate. The adverb subsequently means then, later, or next (following in time, order, or place): Lori graduated from college and subsequently moved to Springfield. "[W]hen someone has the same accent, loves the same indie brand, or also says 'y’all' instead of 'you,' we feel an affinity or bond. Consequently, when we imitate someone, or behave similarly, that person starts to infer that we have things in common or are part of the same tribe." "[I]ndividuals start to learn about leadership at a very early age—from the way in which their parents interact with them, the expectations their parents hold for them, and the rules that they establish for them. Subsequently they learn about leadership from other adult models, including family members, sports coaches, teachers, and TV characters." "Staff members develop their own skills, learn to change organizational policies, and subsequently gain a sense of mastery over their own work environment. Consequently, staff members become better motivated, and productivity increases." "The use of substances such as caffeine, amphetamines, and sedatives does not customarily involve such a high level of ingestion that physical changes are produced. Other substances, including heroin and alcohol, to a lesser extent, can be used in large enough doses to produce the physical changes and, consequently, may subsequently represent a greater physical risk to the body." "Using the four-syllable word [subsequently] in place of the two-syllable word [later] is rarely, if ever, a good stylistic choice"
"These adjectives share some common ground in referring to that which follows as a result of something else, as in "...a statement explaining the overbooking policy and the consequent risk to 'reservation.' The consequential shock almost paralysed him." Consequential in this sense is often a legal term, in BNC examples such as indirect or consequential damages, and the consequential costs or losses mentioned in accounting. But it also means 'important,' 'weighty,' in a consequential congressional leader or a country more consequential than Granada, among various examples from CCAE. With its extra syllable, consequential thus seems to have official or portentous overtones. The briefer consequent has a wider variety of uses in economic, scientific and social analysis." (a) "Atanasoff was put in charge of the project. The detonation was to take place in mid-April 1947. Atanasoff had eight weeks to prepare. He _____ learned through the grapevine that several other scientists had been approached to oversee the project and had refused, thinking that the lead time was too short." (b) "If a course is taught at too low a level, students are unlikely to feel challenged and, _____, they're unlikely to feel highly motivated to learn." (a) "Atanasoff was put in charge of the project. The detonation was to take place in mid-April 1947. Atanasoff had eight weeks to prepare. He subsequently learned through the grapevine that several other scientists had been approached to oversee the project and had refused, thinking that the lead time was too short." (b) "If a course is taught at too low a level, students are unlikely to feel challenged and, consequently, they're unlikely to feel highly motivated to learn." What's the Difference Between the Words 'Confidant' and 'Confident'?